We’ve written in the past about some other sobriety apps that we think can be helpful to people trying to quit or cut back on drinking, so check that post out too! 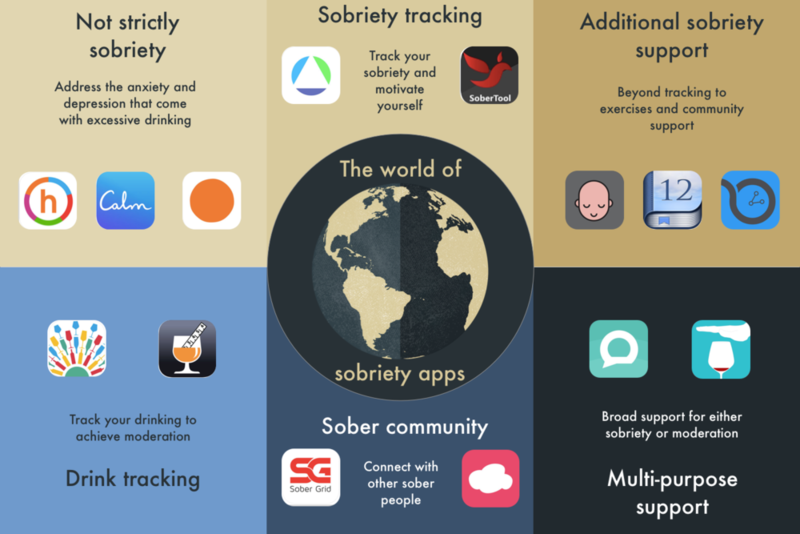 This time, we wanted to share some more detail about how we see this world of sobriety and moderation apps. This can help you decide what might make the most sense for you, given the goal you have and the kind of support you want. These apps all have different costs (some are free; some are not). Not strictly sobriety: These apps help to address the anxiety and depression that can come with drinking to excess. Sobriety tracking and drink tracking: These are two sides of the same coin, where one helps people to track the amount of time they’ve been sober, and one helps people track their drinking to stick with a moderation goal. Often, these apps help build motivation by tracking money saved or other health benefits of sobriety or moderation, or offering motivational quotes. Sober community: These are apps that help people get live support from peers who are also trying to stick with sobriety. Additional sobriety or moderation support: There are another suite of apps that go beyond tracking (and motivational stats) to offer community support as well as exercises or games to help people stick with their goals. Some focus solely on sobriety goals, while others, like Drinker’s Helper, are intended to help people with either sobriety or moderation goals. How do you see the world of apps? Let us know if there’s another type of app you see as being particularly helpful to you! Alcoholics Anonymous, the most prominent organization dedicated to helping people quit drinking, is known for its support groups where people share their stories of recovery and collect sobriety coins to indicate the passage of time in recovery. Many secular organizations do the same, with the core of their program as a support group. But why do they do this? What is the value of a support group? There is ample proof that social support can help people with recovery from alcohol addiction. Here is what support groups do for people who are quitting or cutting back on drinking. Let them know they’re not alone. One of the reasons peer support groups in particular can help people quit or cut back is that people suddenly see themselves as part of a community. If you’re not alone, your challenges are normal, you can be understood, and you can be supported in the way you need. Encourage them with success stories. If you’re in a group with people who’ve completely gotten sober (like an AA sponsor), you can see that sobriety is possible. But even short of that, you can get meaningful encouragement from hearing from others who got through an urge to drink without giving in. Helps them stay happy. Social support has been shown in multiple studies to significantly help people counteract depression when they were dealing with alcohol abuse disorder. Giving them a sense of purpose. One study of Gamblers Anonymous showed a positive impact on chances of recovery from people providing support to others, rather than receiving support. When people in the group helped others, it presumably reinforced their belief in the importance of recovery. Knowing how important support groups can be, we knew we had to do more than just offer helpful exercises, tracking, and insights in our app, if we wanted to really help people quit or cut back on drinking. That’s why every member in Drinker’s Helper has a group to talk to. You are grouped with similar people: You’re matched with others based on having similar drinking habits. Our quiz splits people into four groups based on their past drinking levels as well as the level of dependence or abuse of alcohol that is evident from answering the questions. People who show higher or lower levels of abuse or dependence are grouped together, so that people can offer each other advice and support from a place of empathy and understanding. You are prompted to share: There are weekly prompts to inspire discussion, introducing such topics as highs and lows of the week, or things you’re proud of along the way. There are also individual prompts available if you tap the Drinker’s Helper icon if you’re not sure what to say. If you’re interested, you can try out Drinker’s Helper free for a week, and meet your support group!